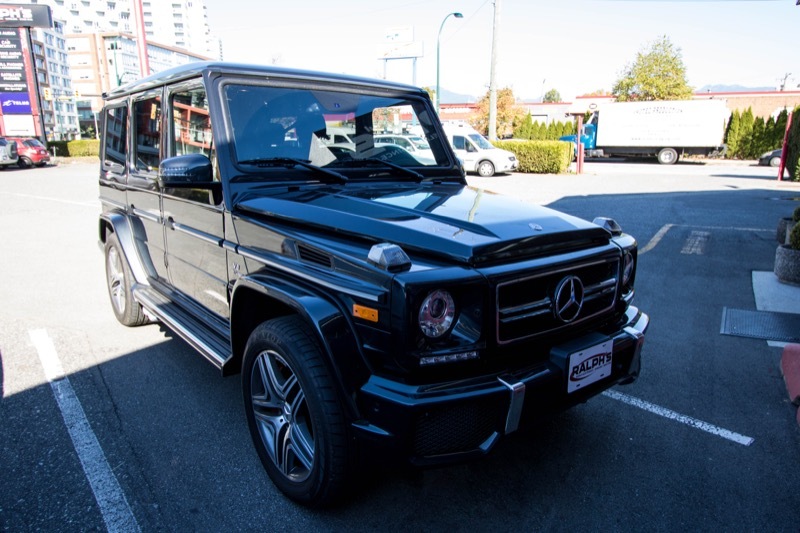 A client of Ralph’s Radio recently dropped by the Vancouver store to talk about a subwoofer upgrade in his 2017 Mercedes-Benz AMG G63 SUV. We had recently finished a major sound system installation in his 2016 Ferrari 488 GTB and he loved the way it sounded so much, he wanted to upgrade the Harman Kardon audio system in the vehicle. After some research and testing, it became apparent that there was no suitable integration module for the MOST fiber optic audio system in the 2017 G63. Plan B was to upgrade the factory subwoofer until a complete integration solution became available. The enclosure left the client plenty of storage space for longer trips. After a look at the vehicle and discussing how the client used it to trek between Kelowna and Vancouver, we decided that a compact, sealed enclosure with a pair of APS 10 D Audison subwoofers would be the perfect addition to warming up the sound system. We proposed adding a few styling touches to the enclosure to bring it up to the same level as the rest of the vehicle interior. The unique inserts and upholstery of the enclosure give it a factory look. Our fabrication team created the enclosure from ¾-inch MDF. We rounded over the edges using our router and a radius bit. The back of the enclosure is angled so that it fits snugly against the rear seat while minimizing the overall size. We created trim inset panels for the front and sides of the enclosure and machined a diamond pattern in the faces to match the finish of the leather on the seats in the SUV. To finish the construction, we wrapped the accent panels in perforated black vinyl and the remainder of the enclosure in a conventional textured black vinyl. Easy level control of the subwoofer system is at the client’s fingertips via the PAC remote. The Focal amplifier and PAC interface fit neatly under the seat. To power the subwoofer, we installed a Focal FPX 1.1100 amplifier under the passenger seat. We used a PAC LP7-2 line output converter to extract an audio signal from the factory amplifier output and make it compatible with the Focal amp. The remote level control for the amplifier is mounted conveniently at the bottom of the dash on the driver’s side – making it easily accessible to fine-tune the bass level for different music sources, genres or moods. The client returned to Ralph’s Radio to have a listen to the upgraded Mercedes-Benz AMG G63 subwoofer system. He was impressed at how much better the entire system sounded with a quality subwoofer in place. We know he’ll be back for more when then MOST integration solution is available. If you are looking to improve the performance of your sound system, drop by Ralph’s Radio in Vancouver or Victoria and talk to a member of our sales team. Alternatively, send us an e-mail using our contact page for more information.